Believe in Dreams Website Launch! Back soon with lots to say. Look out for the second in my series of Graphic Novels - a work in progress. 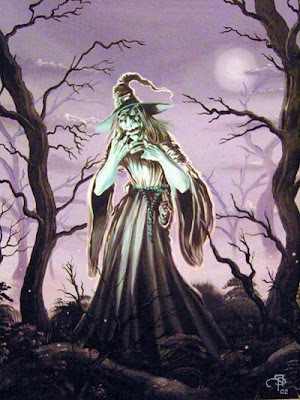 I will occassionally place images here on the Wizards Keep Blog and on the Wizards Keep and Worlds End Websites too. Look out for new pages soon!!! If you live in or around the Blackburn area in the UK, Tim teaches several courses on Fantasy Art. 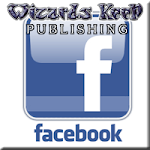 Please check out the Wizards Keep Website for details. Tim regularly visits schools and teaches creative workshops. Please check out the Wizards Keep Website for details on how to hire him. Tim is also available for seminars, presentations and workshops in colleges and regularly teaches at Blackburn College of Art and Design & Edge Hill University. Please see the Wizards Keep Website for details. Please Click the Pic to BUY a copy. Be safe, have fun and watch out behind you!!! After all you never know who will turn up! Well better late than never, as they say. 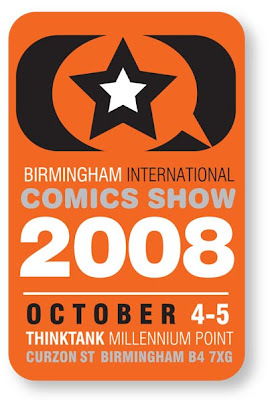 Here at long last is my review of this year’s Birmingham International Comics Show held for the second year running from the Millennium Point exhibition centre in Birmingham. I bid goodbye to Bentley and the other dogs and set off for the convention with the weather very warm and sunny. I arrived late afternoon at Chrissie Harper’s to pick her and Paul Gravett up and then mosey on along to the launch party. I also met her dog, Fred, a delightful little fellow, who seemed to take to me straight away. This is the first ever time to actually hold a piece of paper held and drawn on by the man himself, I had held the framed page from Street Code at this year’s Bristol Comics Convention in May, but had never before now handled a piece of actual board in this way. If the convention had ended here I would have had a great time. Anyhow, the three of us continued on into the city. I parked the car and on the way to the hotel we met up with buddies, Lew Stringer, Mike Collins, Dave Windett and a few others, and after booking into the hotel and leaving my gear in the hotel room, we set off for a meal at the Thai restaurant I had attended last year at BICS. The meal was again beautiful and I highly recommend it if you are ever in that neck of the woods. It is directly across from Bennett’s on Bennett’s Hill and well worth a visit. The inside is very nicely and tastefully decorated and a joy to eat inside of and the staff are very, very pleasant. Well we left the restaurant and went along to Bennett’s for the launch, where I met up with loads of folks, a list of which I will get to in a second. On stage were Liam Sharp on vocals, Charlie Adlard on drums, Phil Windslade on guitar and Paul Birch on bass…they looked the part and sounded…LOUD!!! MY ears still haven’t really recovered, but a great time was had by all. Now the folks I met included, Harry Marcos and his business partner, along with Dez Skinn, Tony Lee, Simon Wyatt, John Anderson, Kev. F. Sutherland, Laura Howell, Rufus Dayglo, and of course Liam, Charlie and Paul fresh from doing their rock star bit on the stage, and Mike Molcher, and Wakefield Carter, with whom I had a great lengthy conversation with about their involvement with the historical re-enactments as pike men and musketeers, etc, which proved very enlightening and interesting. I left the launch party around 1:00 a.m. fearing a night of staying up most of the night, which would have been great, except for the fact I had been doing more mad hours again that week, to enable me to go along. The next day, I met up with a guy at breakfast that I had been speaking to via the Internet, without realising who he was, hiding as he was being dark sunglasses, having spent a little too long at the party…see that’s what experience of such events warns you of. He told me about his work and that he was exhibiting. As he set off to freshen up, before going to the con, I said I would pay a visit to his stand. It wasn’t long before Dave Windett, Mike Collins and a few others arrived for breakfast, just as I was leaving to get to the convention hall itself. They asked why I hadn’t joined them in the bar…I mentioned dark glasses and set off for the con. Upon arrival I met up with Staz Johnson, Lee Townsend and spoke for a while with Brian Clark of Crikey Magazine and his gang of merry men. I had a look around the convention halls, something I haven’t done for years and spoke to Clive at Classical Comics, the guys from the DFC comic, which is looking very good, Alasdair Duncan, on the Insomnia Publications stand, before heading off to matt Yeo’s Bulletproof stand where I had been asked to sketch for an hour from 12:00 noon. I had a brilliant time producing sketches of their character, Marren Kane onto the specially printed blank sketch covers of Bulletproof issue #2 for loads of folks that stopped by. I also did a sketch of Jack Kirby’s Darkseid for a guy, whose name I sadly cannot remember. It was whilst at the stand that I met up with Claire Green for the first time. 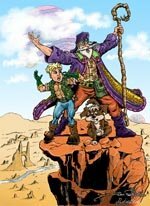 A massive fan of the Dreamstone cartoon series and comic books, which I drew she is a delight to speak to and is now the proud owner of four Dreamstone issue #3 pages. I am glad they now reside in a good home. Following this, Lew met up at the stand and we went for a drink in the café, where we were joined by Nigel Dobbyn. We chatted for a while and then I went back into the hall where I met up with Jon Haward, who showed me the finished black line work for John Stokes’ Classical Comics work due out very soon. The Inking is nothing short of perfection. I for one cannot wait for its release. I had one of my not-to-be-missed chats with David Lloyd, one of the true gentlemen of comics and a joy to be around, who was then joined by Mike Collins. I also met up with the guy from breakfast at his stand and upon seeing the work, realised it was Hal Laren from my Smallzone network. I got two of his comics off him, which I read at home the next day, and I plan on reviewing soon. Leaving his stand I went across to the Cinebook stand, which is a joy for any lovers of European comic art, where I met Olivier Cadic. There I saw some of the best comic book work I have seen in years and was reminded that there is some really incredible stuff out, sometimes swamped in a sea of mediocrity. I was also really pleased to be able to spend the longest time for a good number of years speaking to Al Davison, at his stand. We chatted about his latest works and his shop Astral Gypsy and Wizards Keep and Believe in Dreams and stuff in general about life. 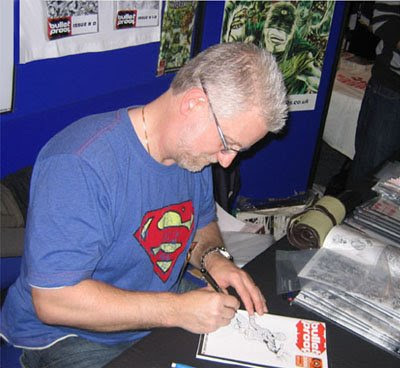 Al is the comic creator I have known for the longest, having met at my first comic convention, which I attended with my younger brother, Chris, back in 1979 at the Birmingham Metropole hotel on the NEC complex. It seemed fitting that we would chat again for a while at the same city. I had planned and stated on the Internet that I would be leaving around 2:00 p.m. – 3:00 p.m., but in the end I left Al’s stand at around 4:45 p.m. I found the weather had finally broken when I eventually left the car park, it was now 5:15 p.m., by the time I was turning off the car park on my journey home. The weather was awful on the drive back north, but the motorway was pretty clear with traffic and I arrived back, without stopping, in time to go to visit my Mum and Dad to check on how Mum was doing, before going home to unload the car, freshen up, get changed and walk across the cul-de-sac to our good friends and neighbours Chris and Susan’s Ruby wedding anniversary - the reason I had to cut the convention short. The two days of Friday and Saturday were incredibly full of stuff to do and folks to see, but what an enjoyable experience. I would like to thank all those that stopped by the Bulletproof stand to chat and ask for a sketch, all those that stopped me to chat throughout the two days, all the professionals that took time to catch up and Claire Green for making the special trip to view the artwork. If I have neglected to add you to the list then please accept my apologies for that. The pleasure was all mine. Thanks to all the BICS organisers, Shane, James and Andy – well done you guys!!! In the meantime here are a few photographs from my time there. Thanks to Lew Stringer for the photos of Matt Yeo and me at the Bulletproof stand. One of my new students on the Fantasy Art Unlimited, Wednesday evening course, which I run actually sculpts in her spare time and produced the two wonderful little sculpted figures for me as a thank you, which I was really touched with. The little guy (obviously me, but better looking) is only approximately four and a half centimetres in height, but incredibly detailed. I may just ask her to produce some for the Worlds End gang, what do you think? 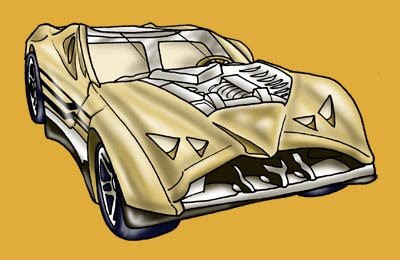 Here is another monthly sneak peak at the cars you’ll see in issue #51 of the Hot Wheels comic, out now, to whet your appetite. 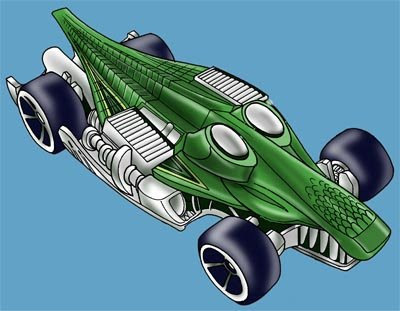 In the Croc Rod story, Ian introduces the Prof’s office, come lounge, inside of the Hot Wheels headquarters, which was fun for me to design and expands the series even further. 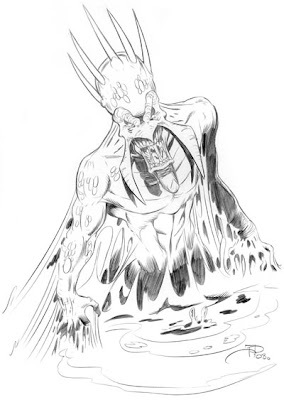 In this story I also use one of DarkClaw’s new henchmen from the last issue #50. In the CUL8R story we see Chuck Speed enter a time trial at the grounds of a stately home. I am looking forward, as always, to hearing what you think of this latest artwork. The comics will be on sale soon, so don’t forget to order a copy!!! Well this last couple of weeks has been even more manic than usual, but I’m back Blogging again at last, just in time to let you guys in on a “maybe not so secret” secret. This coming Saturday will see my wife, Margaret and I launching the new Believe in Dreams website. There are lots of new product ranges from faeries, elves, goblins, dragons, teddy bears, angels, fantasy artwork, gold and silver plated crystal, greetings cards, fridge magnets, keyrings and all manner of fantasy merchandise from artists such as Todd Lockwood, Amy Brown, Jessica Beckett Griffith, Nene Thomas and Anne Geddes, amongst others, as well as all the usual Wizards Keep fare. Drop by the website over the weekend and then pay a visit to the new "Believe in Dreams" on-line shop, just in time for Christmas. The Link will be set up under the shop section on the left hand side column of the Wizards Keep website, between "Tim's Blog" and the "Hall of Fame" and there will be extra links set up in a number of areas in our links section as well under Collectibles, Retail Outlets and Toys. Please feel free to add it to your bookmarks and favourites and check out all the new goodies available from this weekend. As I said the other day, I’ll be posting up a review of the Birmingham comics show, which was even better then last year’s for me this week. 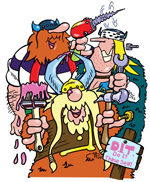 My next post will also contain news on next year’s Bristol Comics Convention 2009, which Wizards Keep will be attending. Hi Guys, I’ll be posting up a review of this last weekend’s Birmingham International Comics Show, which was even better then last year’s for me, but the work schedule means it will have to wait a few days before I put up some photos and words about it all. In the meantime, thanks to everyone who took time to stop by and chat and/or ask for a sketch, etc. I have received some new updates over the weekend as well, regarding the Orphan Works Bill, which is still calling for everyone’s support. I’ll post more information about the affair as I go along to keep you all in the loop. Many thanks to everyone who spoke to me at the convention that asked how my Mum is doing. She is still overwhelmed by everyone’s well wishing and is now on the long route to recovery. When I do post next time I’ll also have some news on next year’s Bristol Comics Convention, which I'll be attending with Wizards Keep. Hi Guys, this week has seen a incredible amount of activity in the on-going saga of the Orphan Works Bill. I have just received another post from the Illustrator’s Partnership of America, just now, which looks as though our worst fears are imminent, so I figured I would again post this up here for you guys to see so you can all do your bit. We've been getting assurances all day that the bill was "dead for this year." Please post or forward this message immediately to any interested party. Over 75 organizations oppose this bill, representing over half a million creators. Illustrators, photographers, fine artists, songwriters, musicians, and countless licensing firms all believe this bill will harm their small businesses. 2 minutes is all it takes to tell the U.S. Congress to uphold copyright protection for the world's artists. CALL CONGRESS: 1-800-828-0498. Tell the U.S. Capitol Switchboard Operator "I would like to leave a message for Congressperson __________ that I oppose the Orphan Works Act." The switchboard operator will patch you through to the lawmaker's office and often take a message, which also gets passed on, to the lawmaker. Once you're put through tell your Representative the message again. Place "Add Name" in the subject line, and provide your name and the email address you want used in the message area. STOP THE U.S. ORPHAN WORKS ACT NOW. Please post or forward this email to any interested party. If I hear more I’ll let you guys know. 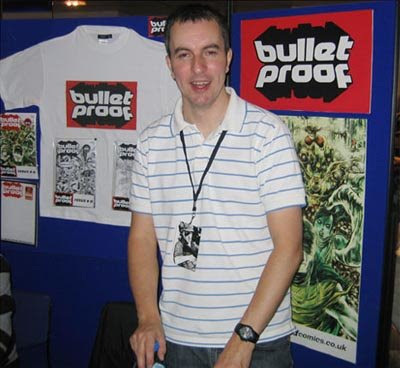 Hi Guys, I have just been asked to sketch on the Bulletproof stand by Editor-in-Chief and Publisher Matt Yeo, which I have agreed to do. I will be on the stand sketching for folks on Saturday between 12:00 noon and 1:00 p.m., so come along to see us there. I am looking forward to meeting as many of you as possible during my stay throughout the Friday and Saturday, as always. I am sorry I can’t stop longer this year, but, like most folks going there, I am excited as ever, anyhow. 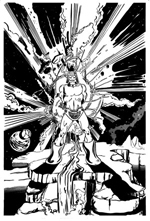 Now I just have to finish this digitally painted cover for Harry Markos at Markosia and I am all set. Hi Guys, I will be attending the Birmingham International Comics Show this weekend. I will be down for the Friday Evening Launch Party at Bennett’s as I was last year. I will also be going along to the convention itself on the Saturday, until around 2:00 p.m. only. I know there are a few of you who are expecting to meet me there, so don’t hide away as I will only be there this year for a short while, due to recent family commitments and also my current workload as well. I’ll be attending the Friday Evening Launch Party at Bennett's, which starts at 8:00 p.m. until late. I will then be attending the event itself on Saturday Morning until early afternoon, probably only about 2:00 p.m. ONLY due to current family and work commitments. I'll be taking along the latest pencilled pages from the Worlds End graphic novel, so you can take a look at them before I digitally paint them, if you would like to. I’ll still be taking a few things, which you can purchase from me, but due to only attending for a few hours there will be limited stock of the items below - so please, don’t hang about, come up and ask to see them, I don't bite (honest) and I'll be only too happy to show them to you. 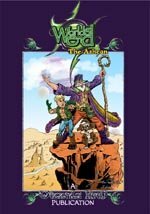 I’ll have issues of Worlds End - The Ashcan for sale at £1.50 - remember these copies, being convention copies will come with a £2.50 money back voucher, which you can use against the purchase of the graphic novel, due for release in 2009. 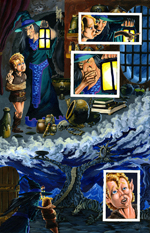 This is the prologue to the graphic novel story and contains artwork, which will not be in the graphic novel. John Ridgway cites this book as the best of my career. I’ll also have some "Freebies" with me, so please feel free to ask, when you make a purchase. I may also have a limited amount of time for convention sketches, although nothing definite has been planned this year. I am looking forward to meeting as many of you as possible during my stay, as always. Hi Guys, this week has seen a lot of activity in the on-going saga of the Orphan Works Bill. I have just received another post from the Illustrator’s Partnership of America, today, so I figured I would again post this up here for you guys to see. Wired Magazine has posted an article: "'Orphan Works' Copyright Law Dies Quiet Death"
It's not dead till it's dead. According to our DC sources, the most efficient way for Congress to pass this bill now would be for the House to scrap their own version and adopt the Senate's. There are procedural ways they can do this. Some say they will; some say they won't. It's enough to know they can. There are special interest groups promoting the House bill now: big stock houses, for example, like Getty and Corbis, and groups working with them. They want an infringer-friendly "dark archive," a privately owned "entity" sanctioned by the Copyright Office where infringers would file a notice of intent to infringe a work. Since artists would not have access to this dark archive, the "sanctioned entity" would be of no use to us until our work has been infringed and we've filed a case in federal court. And then it would mostly serve the interests of infringers - letting them prove in court they had done the minimal necessary paperwork before they infringed. The important thing to remember about the House bill is that there is no protection for artists in it. It would simply give more middlemen a chance to profit from this gutting of copyright law. We know it's hard to ask Congress to focus on copyright law with a financial crisis looming. But we didn't pick this fight and it's our rights at stake if we don't. There is no national emergency for orphan works that requires Congress to pass this bill - which was drafted in secret - in the dark of night. Please contact your House Representative today. Tell them not to pass the House bill. Tell them not to adopt the Senate's. Tell the U.S. Capitol Switchboard Operator "I would like to leave a message for Congressperson __________ that I oppose the Orphan Works Act." The switchboard operator will patch you through to the lawmaker's office and often take a message, which also gets passed on, to the lawmaker. Once you're put through tell your Representative the message again.